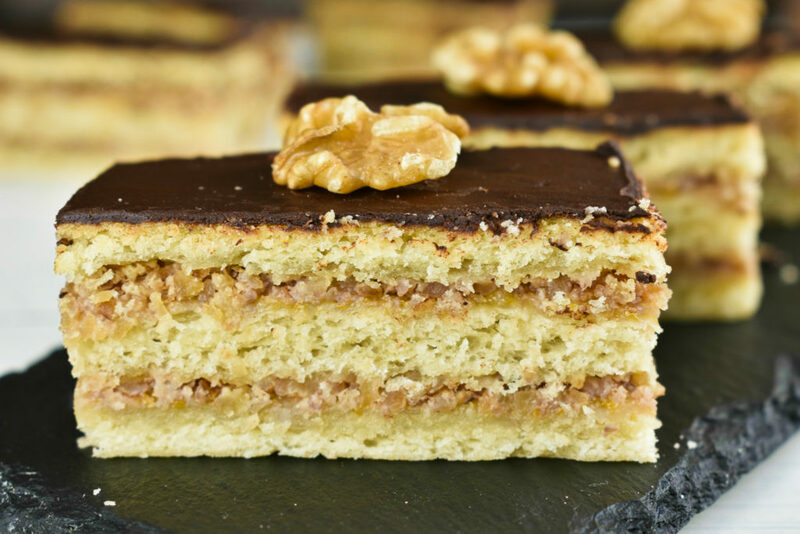 Gerbeaud is a three layered cake bond together with a mortar of walnut and tangy apricot jam. Double bite sized sweet treat under a thin chocolate layer. All of these cakes were developed and perfected by visionary confectioners with years of training behind them so it’s probably not a coincidence that everyone loves them. Emil Gerbeaud was a Swiss confectioner descent who moved to Budapest in Hungary by the persuasion of Henrik Kugler in 1884. Henrik Kugler was a third-generation confectioner with years of experience in 11 capitals of Europe and owned a successful confectionery shop in Budapest when he invited Gerbeaud to work with him. Gerbeaud accepted the offer and they worked together perfecting cakes, tortes and processes during the years acquiring fame for reliable quality and the pursue of perfection in their work. Gerbeaud story isn’t studded with romance, betrayal or global secrets as it is the case with Rigo Jancsi cake or the Sacher torte. Even after the death of Henrik Kugler Gerbeaud carried on with the business founding a public company and naming it Kuglers Nachfolger Gerbeaud AG (Kuglers Successor Gerbeaud PLC). How nice is that. Gerbeaud continued the business creating and selling cakes in Café Gerbeaud, making the name recognizable all over the confectionery world. The café is still up and running today with a completely renovated interior, taking us back in time when stepping over its doorstep. The staple of Café Gerbeaud and probably most famous cake is the similarly named Gerbeaud cake, caring its founder name. The Gerbeaud cake isn’t an intricate cake by any measures but wins hearts easily of those who try it. It’s a three-layered apricot jam and walnut filled almost, bite sized brick with chocolate icing on top. It’s not a particularly exciting looking cake but it’s not a pound cake either. This recipe will skip on sugar as all our recipes do that and substitute that with natural ingredients like honey, agave or stevia leaves. 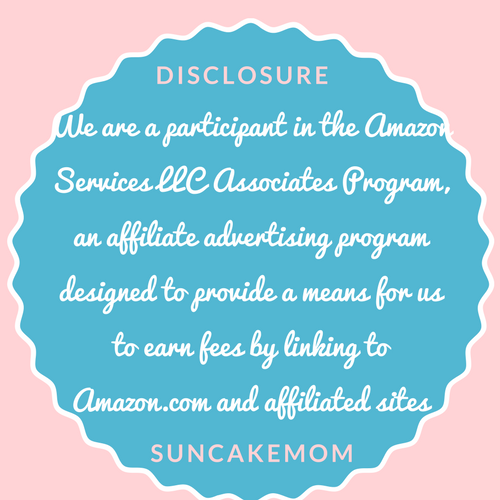 SunCakeMom recipes try to use as little additional sweetener as possible and use the already present sweet tastes in the ingredients to create enjoyable desserts. As the sugar addiction requires us to have more and more of it over time to feel the same sweetness, we can reduce it the same way and enjoy the natural flavors of food again. It isn’t an easy process and can’t happen overnight but taking back control over what we eat is definitely worth the effort. 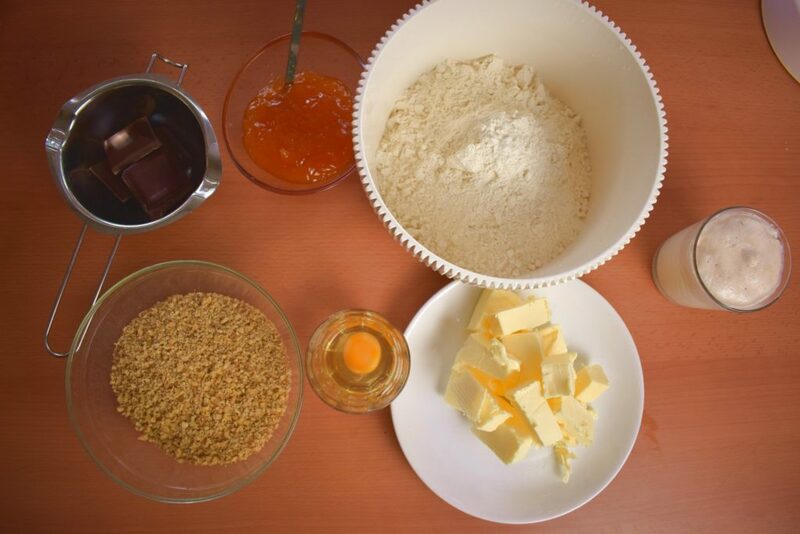 Although most Gerbeaud cake recipes require a ton of sugar, it is only there to set the cake’s sweetness to local tastes, not because the cake wouldn’t be enjoyable without it. 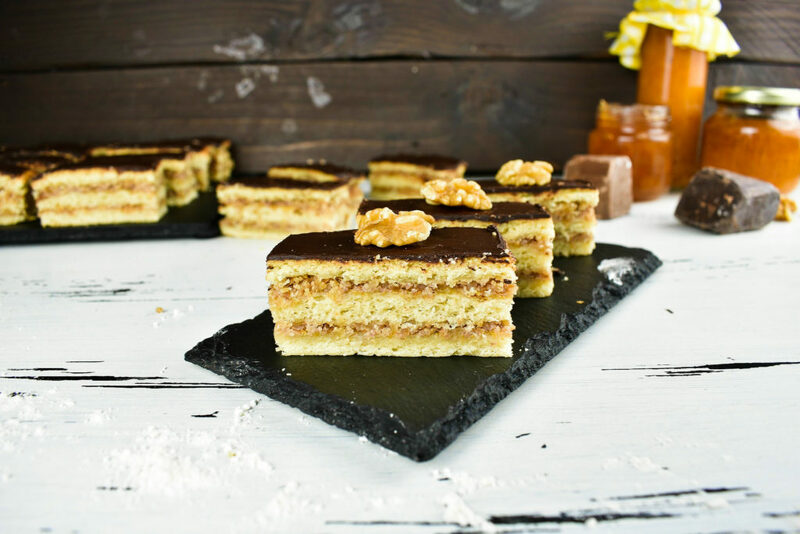 The walnut and apricot jam fillings are both sweet in taste, provides sufficient sweetness, apart of exciting the cake with the flavor of summer and autumn. 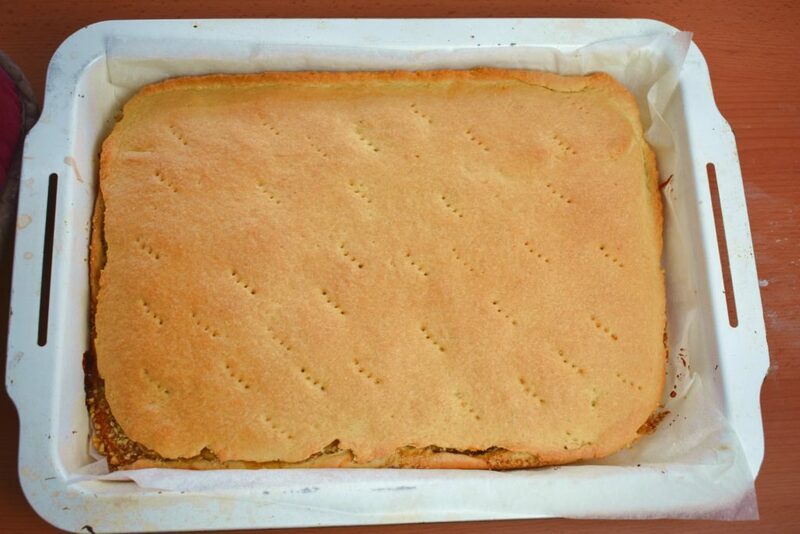 The cake is light and almost fluffy when fresh which is a real joy to have from a small cake like this. Although the consistency changes over time to a more dense and heavier cake, it will be equally enjoyable after a longer period of time as well as long as mold won’t attack it. 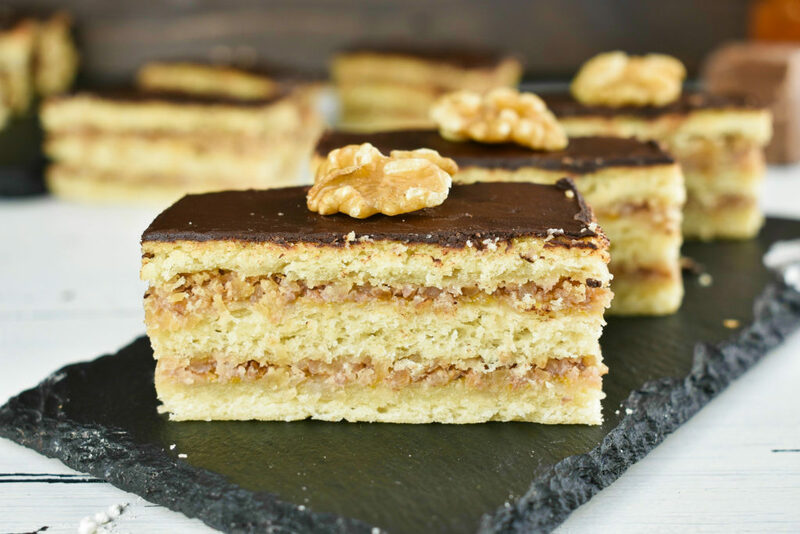 So, it’s definitely a memorable cake where the roughly ground walnut bonds together with the smoothness of the apricot jam making the layers unite together in harmony. 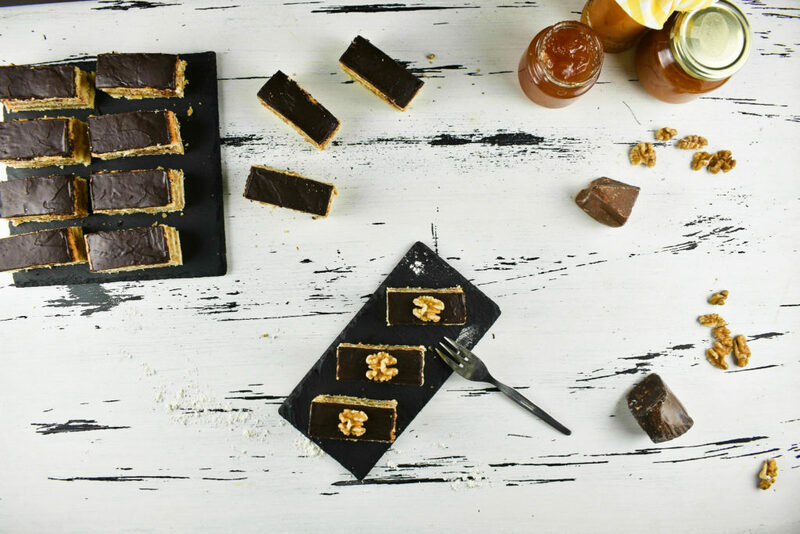 The chocolate provides an exciting contrast with the cake, swirling all the dark flavors of cocoa around the tangy apricot jam and sweet walnut. Get all ingredients ready. Measure flour, milk, wash and shred lemon, slice butter, grind walnuts. Put honey into the lukewarm milk with the yeast to dissolve. Leave it for a couple of minutes until it gets foamy. 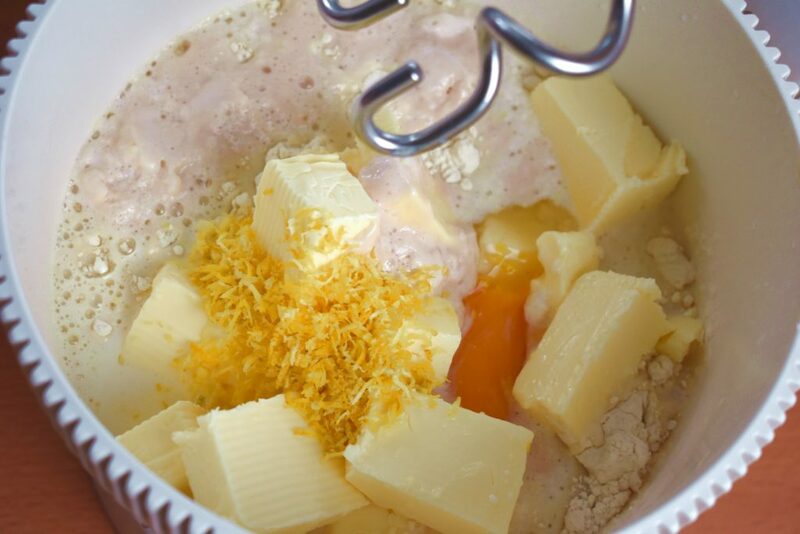 Meanwhile put flour, egg, butter and lemon zest into a mixing bowl then pour the milk into it as well. 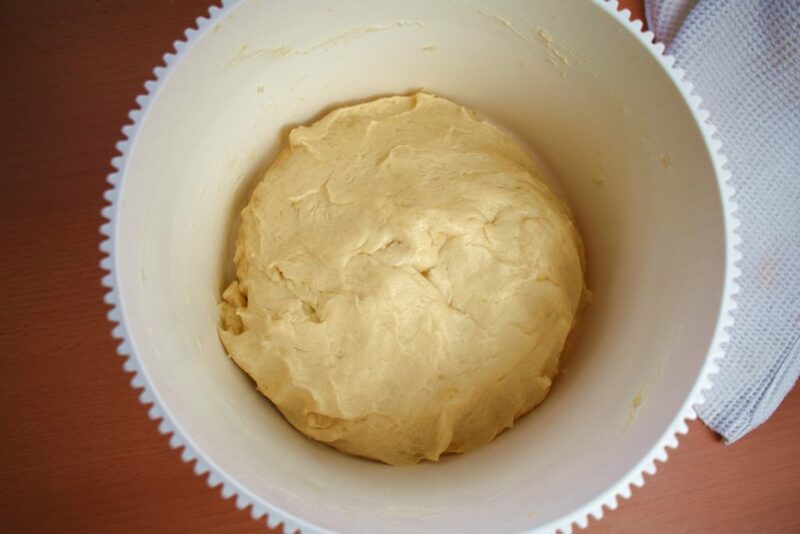 Cover mixing bowl with the dough with a kitchen towel and leave it to rest in a warm place for half an hour. 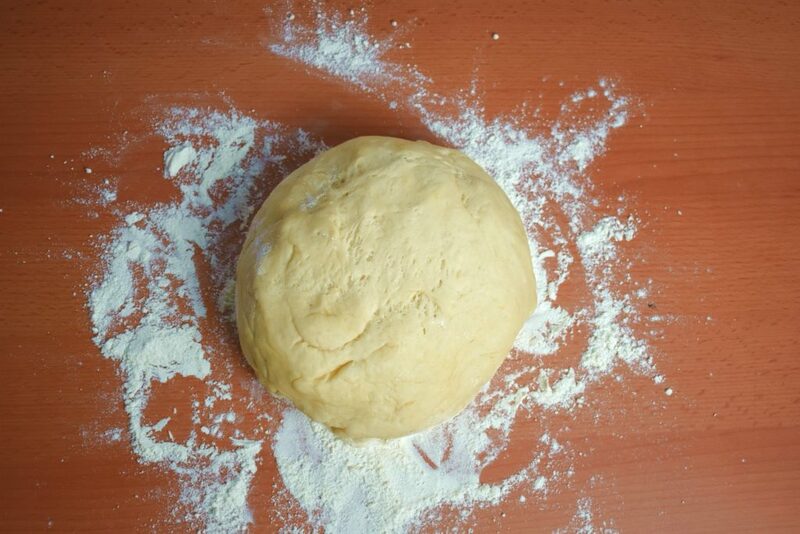 After half an hour, take the dough out of the bowl onto a floured surface. Divide it into 3 equal pieces. Make balls out of them. 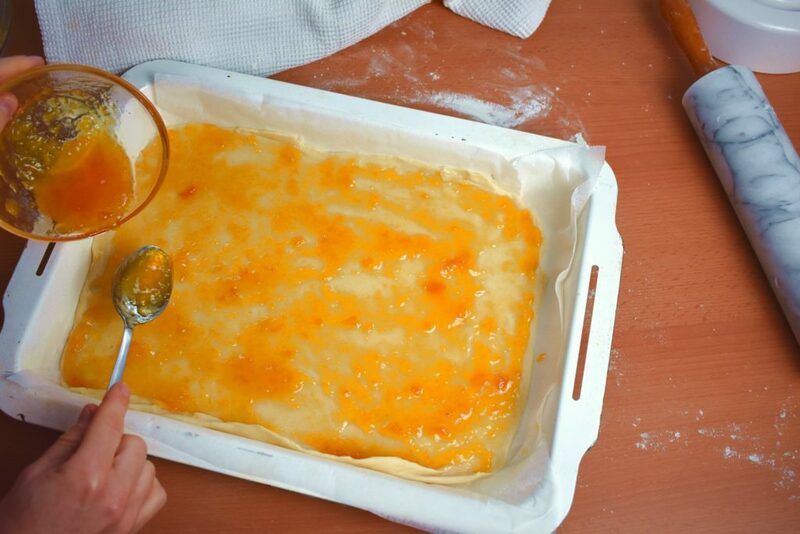 Heat the oven to 350°F / 180°C degrees and get the baking tray ready by putting parchment paper into it. Set 2 pieces of balls aside. 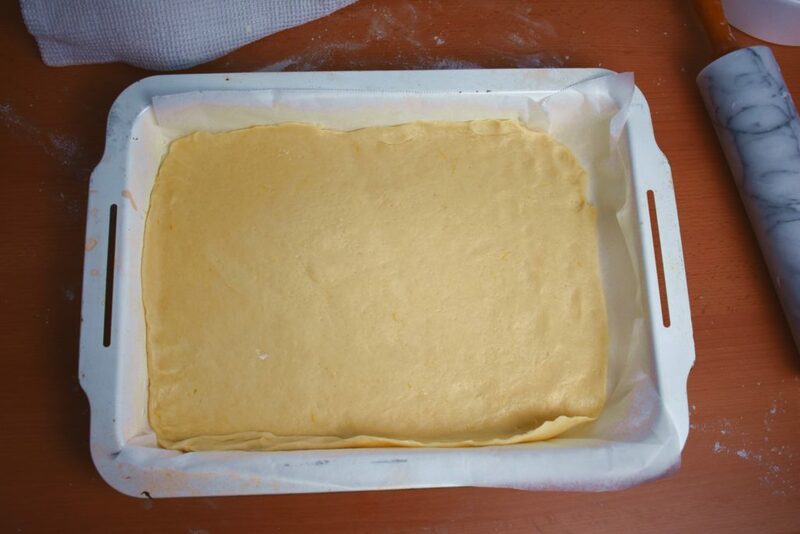 Get the third ball and on the floured surface roll it out to the size of the baking tin. 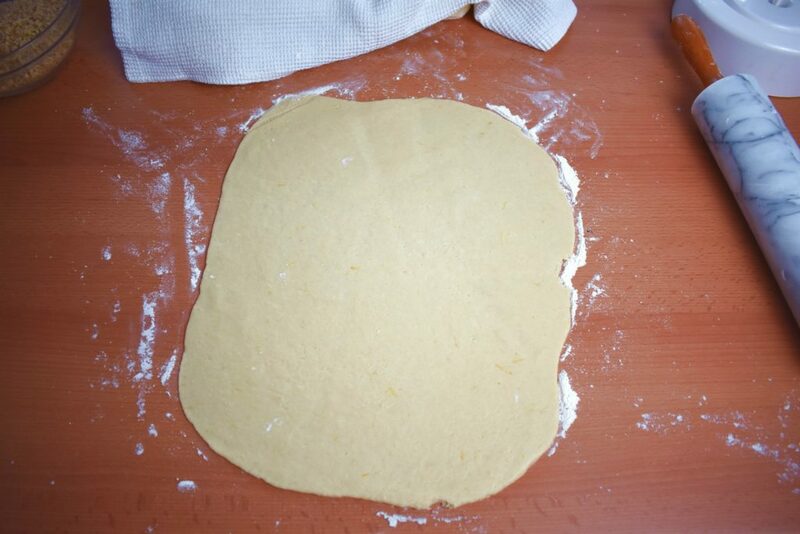 Lay the flattened dough into the tray. 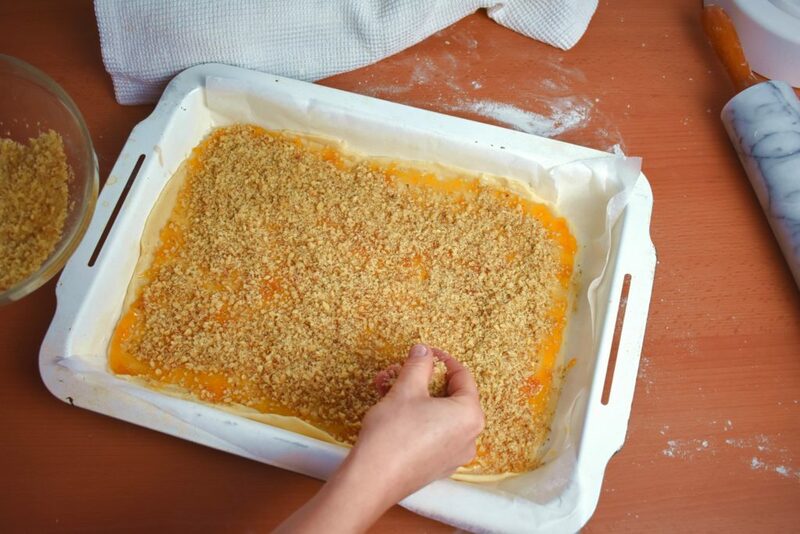 Divide the apricot jam and the ground walnut into two equal pieces. 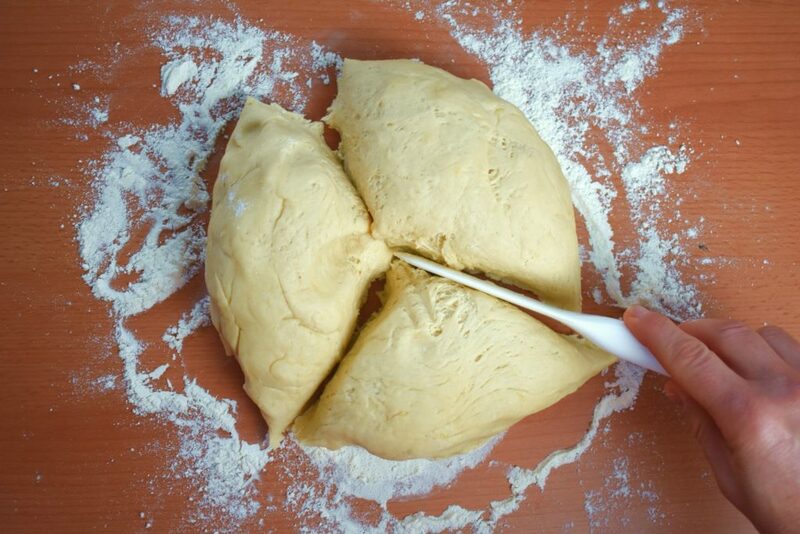 Spread the first half of the jam on the first layer of the the dough. Sprinkle half of the walnut on top. 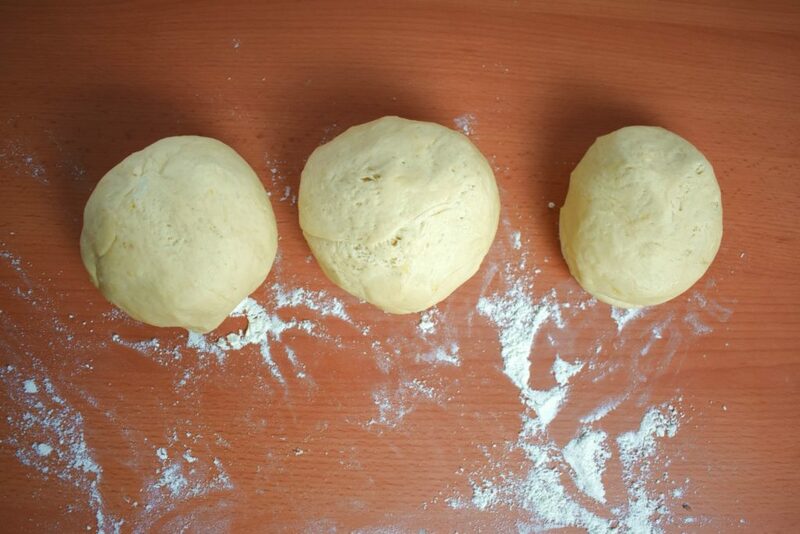 Repeat the steps: roll out the second ball, put it onto the first layer, spread jam and sprinkle walnut on top. Finish with rolling out the third ball and place it on top. Poke the top with a fork. 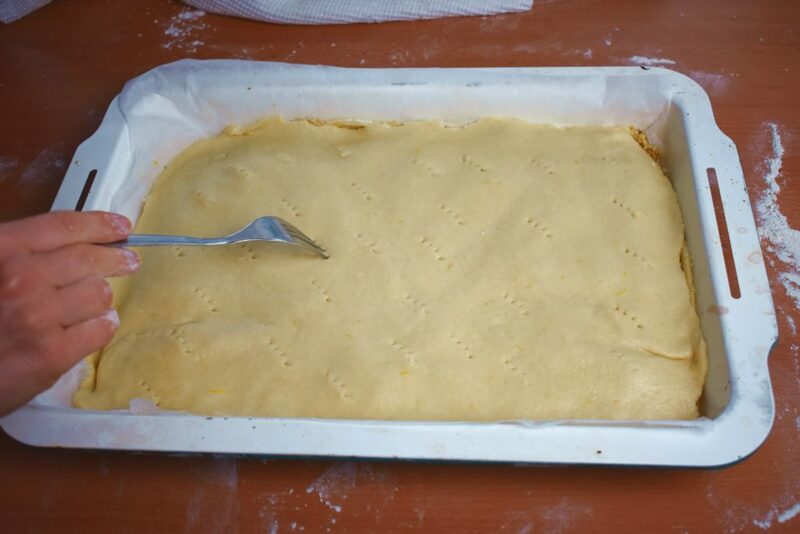 It might seem like an unnecessary step but if you miss it out, the top layer will be uneven an cracked during baking. 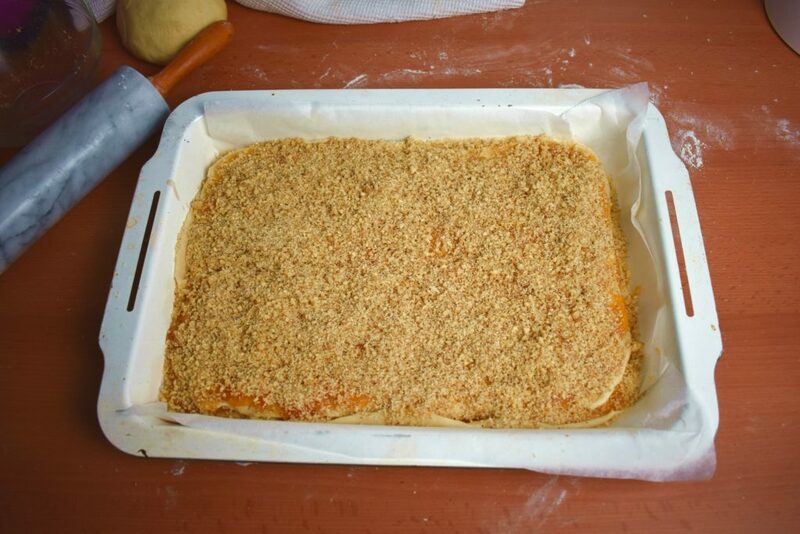 Place it into the preheated oven for about half an hour or until the top is golden brown. 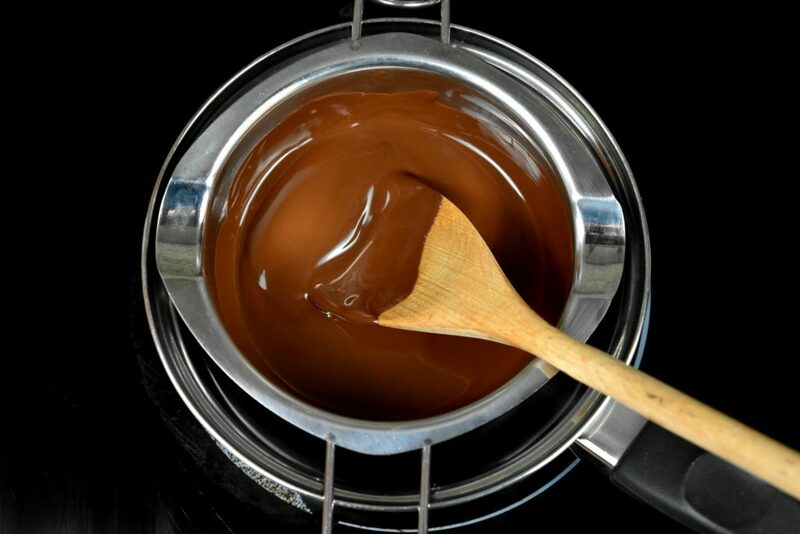 For the chocolate cover melt chocolate, butter and unsweetened cocoa powder in a small pan over steaming water. 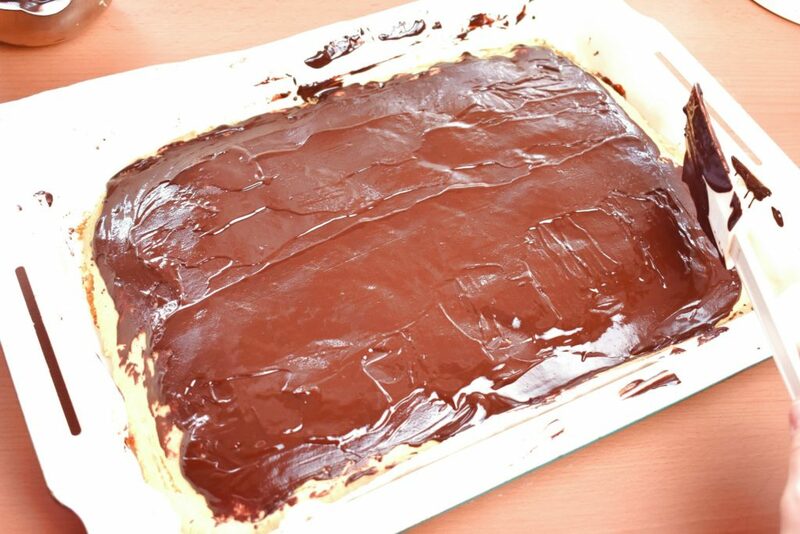 Spread the chocolate evenly on top of the cake. 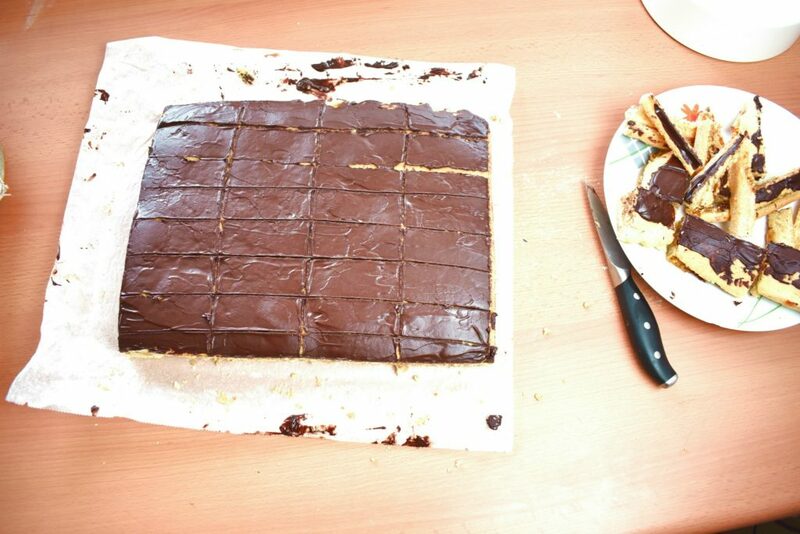 Let it cool down and cut it into rectangles to serve.